The harp was a favourite instrument of the Art Nouveau, and Hasselmans himself bequeathed it with a number of solo concert pieces that were highly popular in their day. Assembling a large selection of these compositions, some of which have never been recorded before, Sacchi reveals the virtuoso’s predilection for German Romanticism. Total playing time 68' 45"
Alphonse Hasselmans was one of the greatest harp virtuosos of his generation, equally renowned for his powerful sound and velvet touch as for his style of teaching. The Belgium-born maestro was appointed professor at the Paris Conservatoire in 1884, and his class soon garnered a reputation for excellence, preparing all the great harpists of the 20th century. 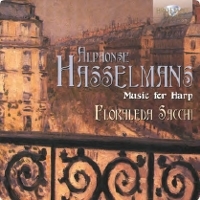 Today many harpists can trace their pedagogical lineage back to Hasselmans – including Floraleda Sacchi, the soloist on this recording. The harp was a favourite instrument of the Art Nouveau, and Hasselmans himself bequeathed it with a number of solo concert pieces that were highly popular in their day. Assembling a large selection of these compositions, some of which have never been recorded before, Sacchi reveals the virtuoso’s predilection for German Romanticism and in particular the influences of Mendelssohn, Schubert, Schumann and Chopin. Never too long, never excessive, but highly refined in colour, the works – which correspond to Hasselmans’ views on harp writing as set out in his short essay La harpe et sa technique – present a unique insight into the cultural flourishing of fin de siècle Paris. Sacchi, who has recorded for labels such as Decca, Deutsche Grammophon and Tactus, performs them with aplomb.